Dealing with difference can be difficult for kids. They may feel self-conscious or may even be made fun of at school by other children. Or perhaps they have even made fun of another child for being different themselves. While kids do benefit from direct advice and encouragement from their parents, learning lessons on their own, when pushed in the right direction can make an important impact on them. 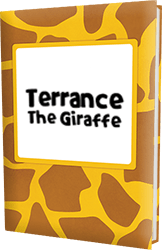 Our newest title, “Terrance the Giraffe” a personalized kids book featuring your child with Terrance, sets kids on a personalized journey with the title character who is the subject of teasing because he is different. Throughout the story, kids realize Terrance’s struggles but then help and join him on his way to overcoming his teasing and accepting himself. This personalized story can offer an extremely important message for kids. It helps boost their self-esteem if they feel they are different or feel as if they do not fit in. Alternatively, it teaches kids just how hard it is for some of us who feel different and are treated differently. As kids embark on this personal journey with Terrance the giraffe, they learn a bit about themselves, about others, and how everyone should be treated: with respect and kindness. Kids can gain enormous insight through this personalized book, learning to accept and embrace their differences, acting confident when confronted with the issue, and treating others who are different with respect. Learning these lessons in a personalized way helps them develop their character and independence, forming their own opinions, and learning to overcome their personal problems or obstacles in a healthy and independent way.